It has been entirely fortuitous that this Little Black Classic has fallen into step with Remembrance Sunday and Armistice Day. I asked my friend Becky to choose for me after we attended Alice’s Adventures Underground together back in July, which I mentioned when I blogged about Mozart’s My Dearest Father. 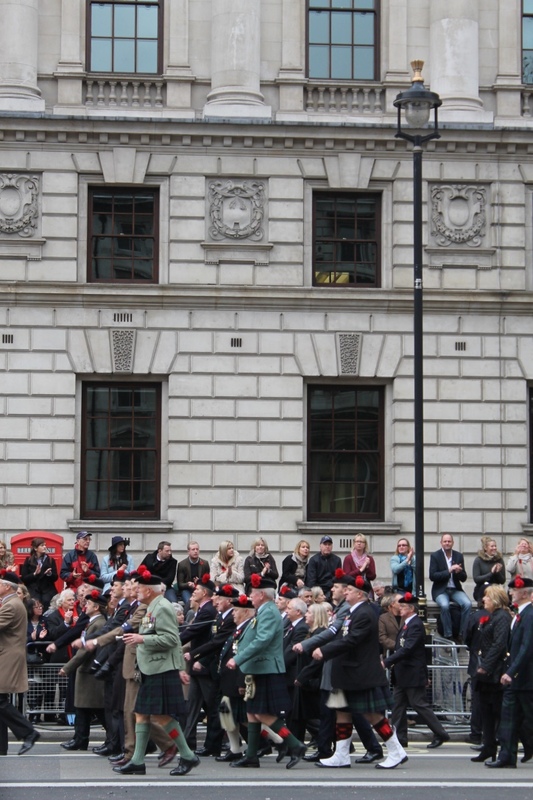 And so here I am, a poppy pinned to my lapel, and the Great War poet sitting before me. For any readers who perhaps aren’t familiar with this poppy the British wear from early November, or what Remembrance Sunday or Armistice Day are, I will come to this shortly. 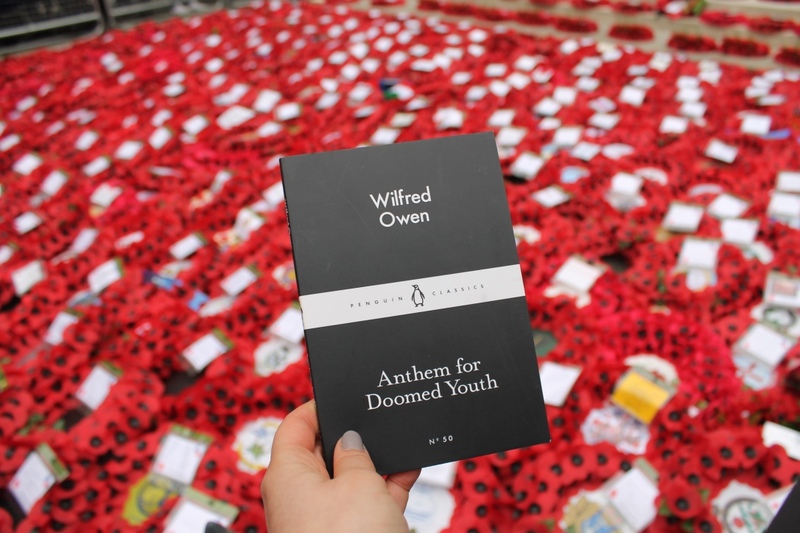 But for now I would like to greet Wilfred Owen and give him the attention he duly deserves. 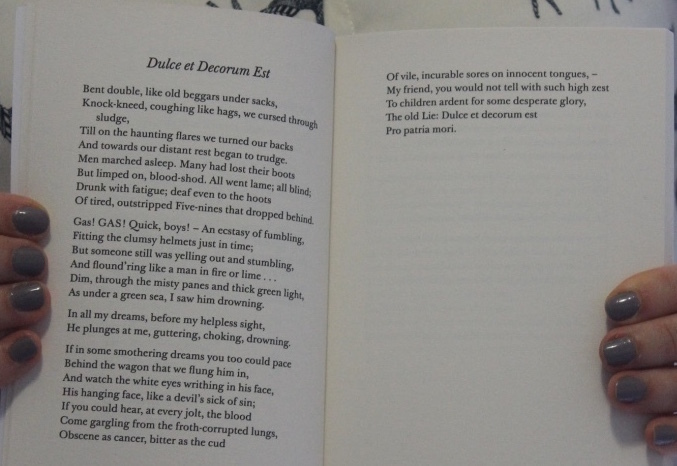 As with most Brits, I became familiar with Wilfred Owen at school. We studied the World Wars in depth for GCSE History and travelled to the battlefields of France and Belgium to better understand the terrible warfare that those fields witnessed from 1914 to 1918. Reading Owen this month transported me right back to the battlefields and the British, French and German graveyards that we visited on that Battlefields trip. In contrast, I read this Little Black Classic on a train down to Plymouth where my Mum’s family are from – you might remember from The Voyage of Sir Francis Drake. Passing through Devon’s idyllic valleys, surrounded by folding hills dotted with frothy sheep, and blanketed with Autumnal trees, I couldn’t have been more far removed from the horrors of war. But Owen brought it right to my train carriage. A soldier himself, Wilfred Owen poetry’s strips bear life in the trenches. Unlike other primary sources, his direct experience and elevated language makes for highly emotional reading. The second poem of this collection is arguably Owen’s most famous, and transports me right back to my History classroom. Once I could have probably dictated ‘Dulce et Decorum Est’ entirely from memory. 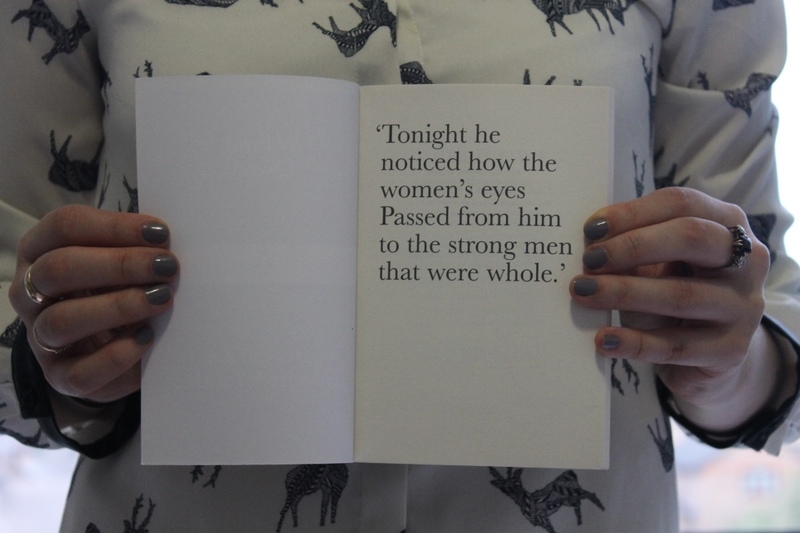 It’s a completely evocative poem. It perfectly captures the horror, the grime and futility of life in the trenches. It’s packed with filth and fear. I can’t highlight sections for you here, I just wouldn’t do it justice. The poem should be read in its entirety. Similarly, ‘Anthem for Doomed Youth’ draws a line under the terrible deaths of these young men who were mown down unceremoniously. This calm jars with the chaos of the other poems in this collection. Owen paints all types of soldiers. In ‘S.I.W.’ He gives us a soldier who kills himself, unable to bear the trenches any more, and in doing so disgraces his proud father, while in ‘The Letter’ it’s a man writing home to his sweetheart, instructing his friend to finish the letter if he is killed in action. ‘Mental Cases’ shows us the impact of shell shock, today more commonly known as post-traumatic stress disorder, while ‘Disabled’ presents men of all ages left physically scarred and dismembered. This really is a terrific collection of poetry. You don’t need to know anything about the First World War to read it; the collection simply gives some sense of life in the trenches and the devastation of war. One hundred years might have passed but, in my opinion, these poem should be read and re-read to remind us. During and after the First World War poppy flowers sprung up in the battlefields of Belgium and France, becoming an appropriate, blood-red symbol for the horror that took place. 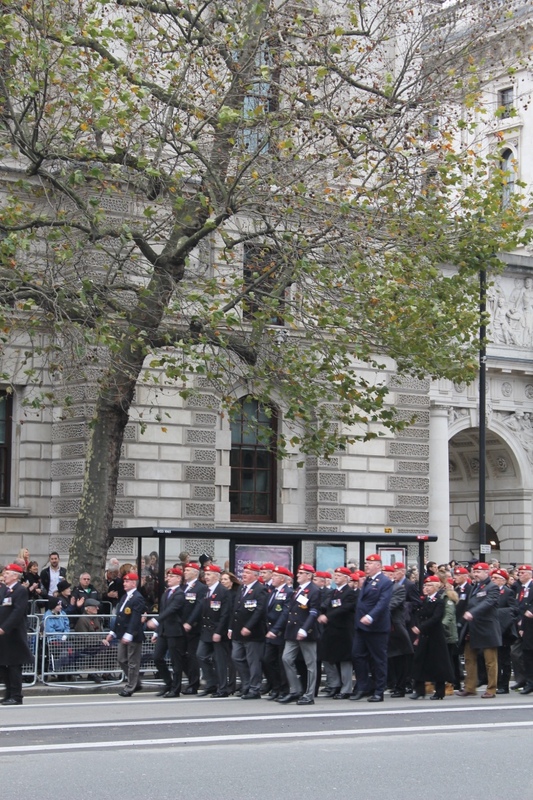 And so, as led by the British Legion, many Brits wear a poppy on their lapels in early November to show that they are thinking of those that have given their lives in combat – both in the World Wars and in more recent conflicts. All proceeds from poppy sales go toward financial and emotional support for members and veterans of the British Armed Forces. This is not to say that every Brit wears one, and no one is expected to wear one. It is a matter of choice. 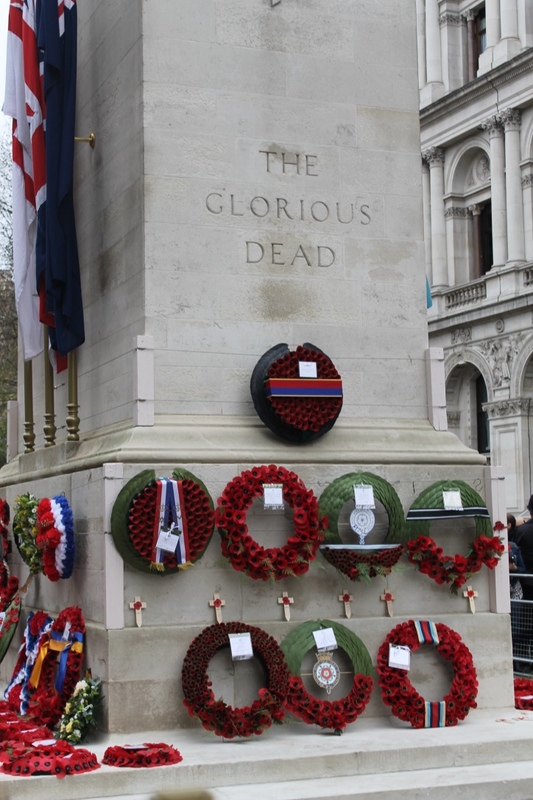 The second Sunday of the month is Remembrance Sunday where church services and parades are held across the country to remember the fallen. Even in my home town, the smallest town in Kent, the local people gather on the high street to watch local organisations march up to our own war memorial. 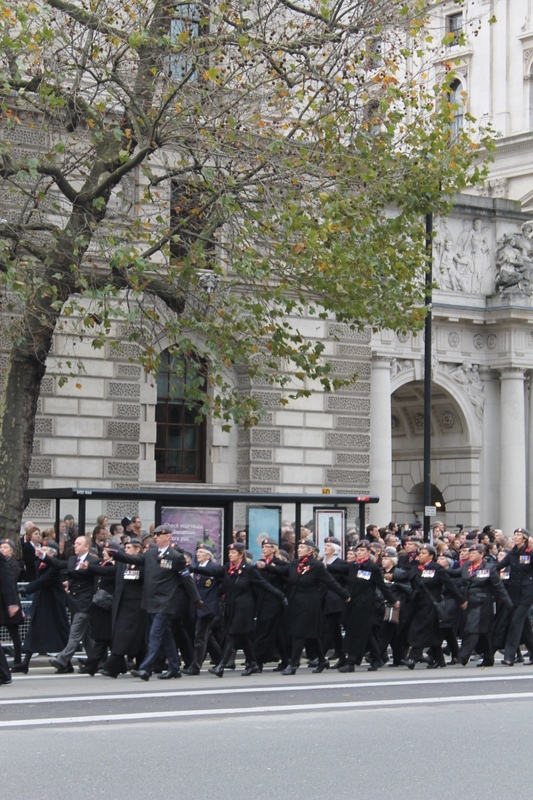 On Remembrance Sunday this year I headed to the nation’s largest Remembrance ceremony at the national war memorial – the Cenotaph. 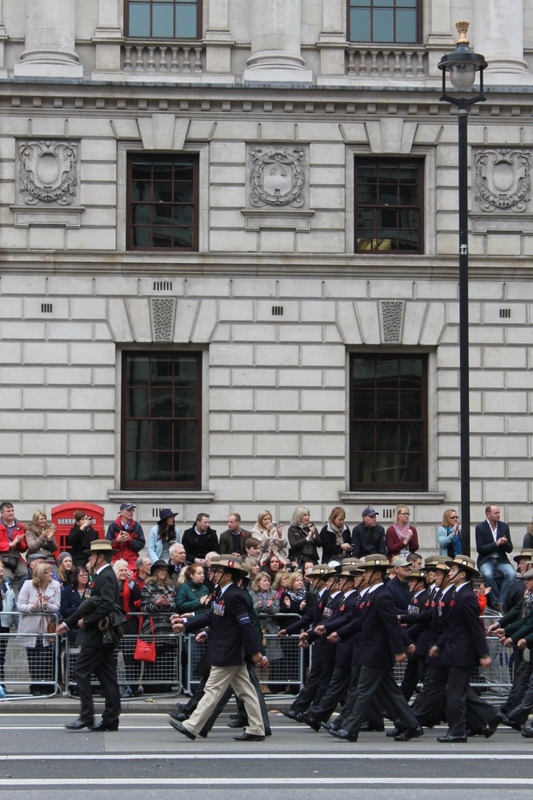 Every year the Royal Family, key members of Parliament and service men and women, along with the general public, line the streets to pay homage to those who have fought for our country and the commonwealth. The proceedings are televised. This year, I grabbed my camera (and a much needed coffee) and made my way to join the throngs. 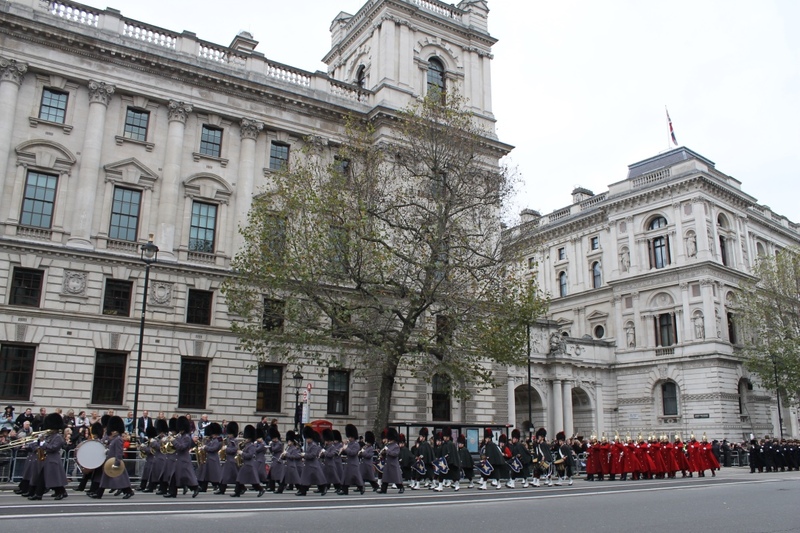 Upon exiting Westminster station, I saluted Big Ben and walked along Parliament Street to Whitehall, claiming my spot as near to the Cenotaph with some sort of a view. To be honest, it wasn’t much of a spot. I was about three people deep in the crowd, despite having got there an hour and a half early. 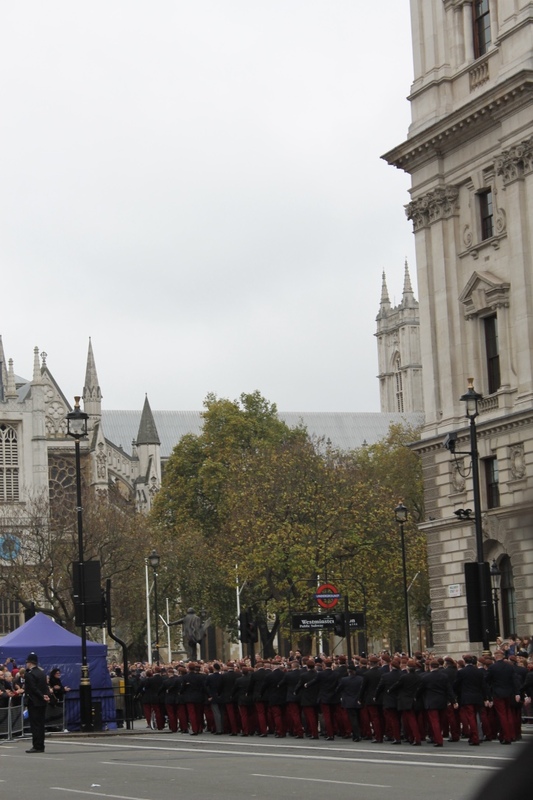 I saw a fair amount of the proceedings through other people’s cameras. You can imagine how deep the crowd was behind me once events actually kicked off. 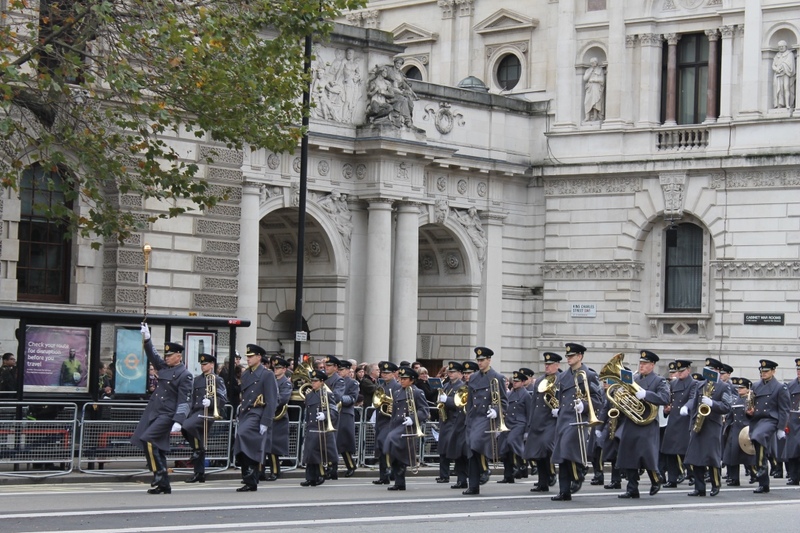 I was between Big Ben and the Cenotaph, the Royal Family and other dignitaries joining from the other side, down from the Mall and Trafalgar Square. 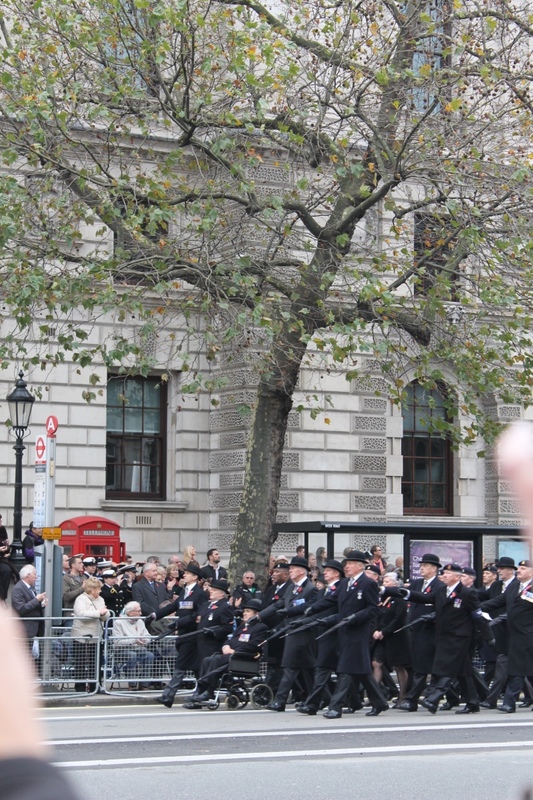 If you want to see pictures of these figures laying their poppy wreaths at the foot of the Cenotaph click here. 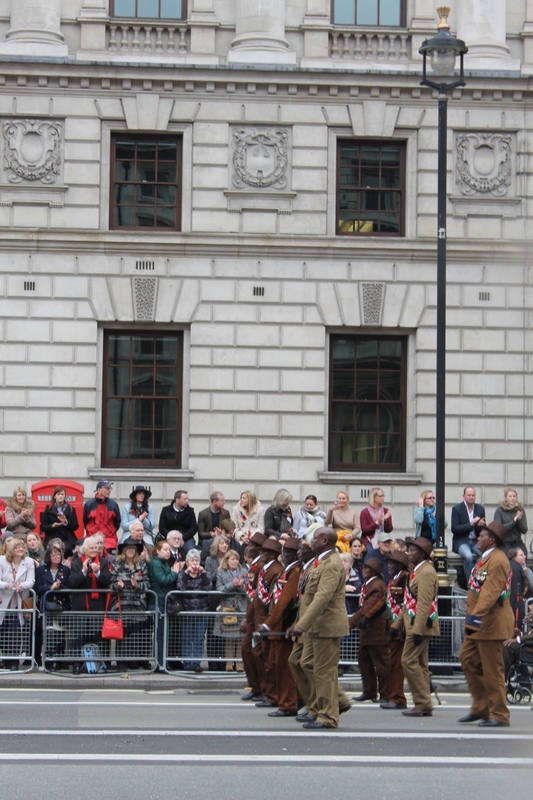 I did, however, watch the various marching bands arrive and we saw the thousands of veterans march, to applause, along to Westminster Abbey after the proceedings. Both were utterly thrilling. 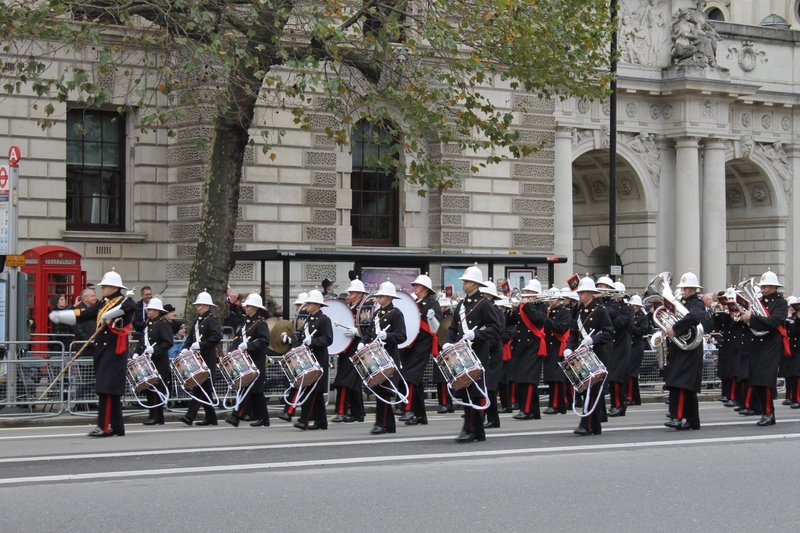 Here are some pictures of the various bands. 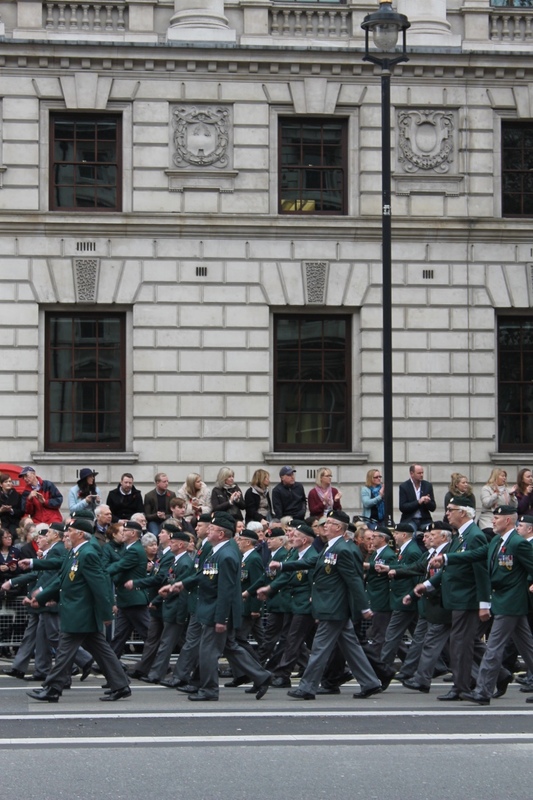 At the bottom of this blog, you will find my countless shots of the veterans. There were thousands of them. 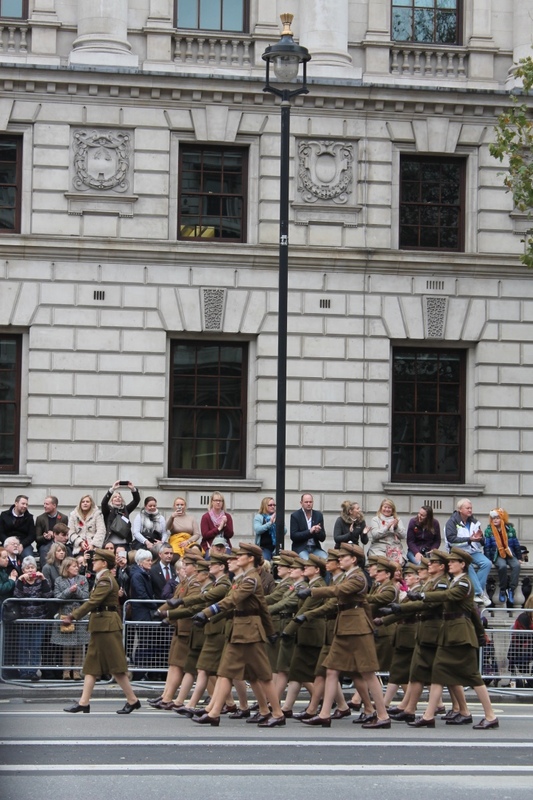 It was amazing to watch them pass in all their uniforms, all shapes, sizes, nations. 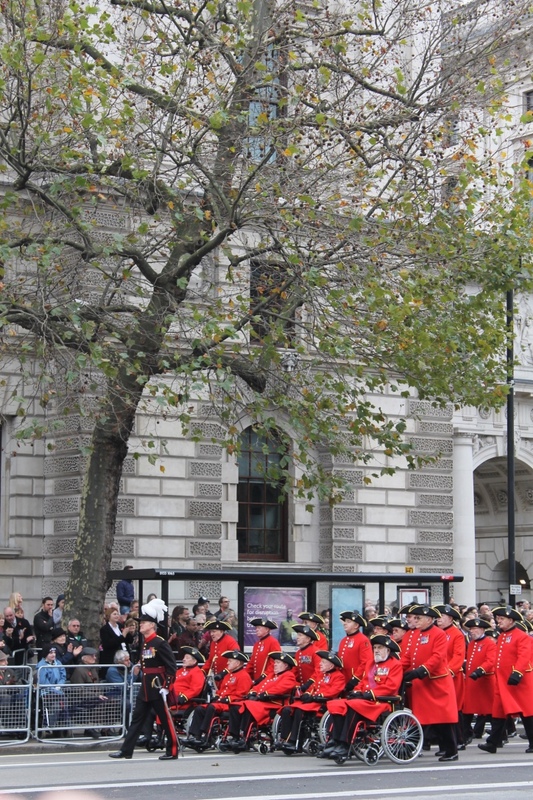 Remembrance Sunday entails various songs and prayers but the main event is the two minute silence. 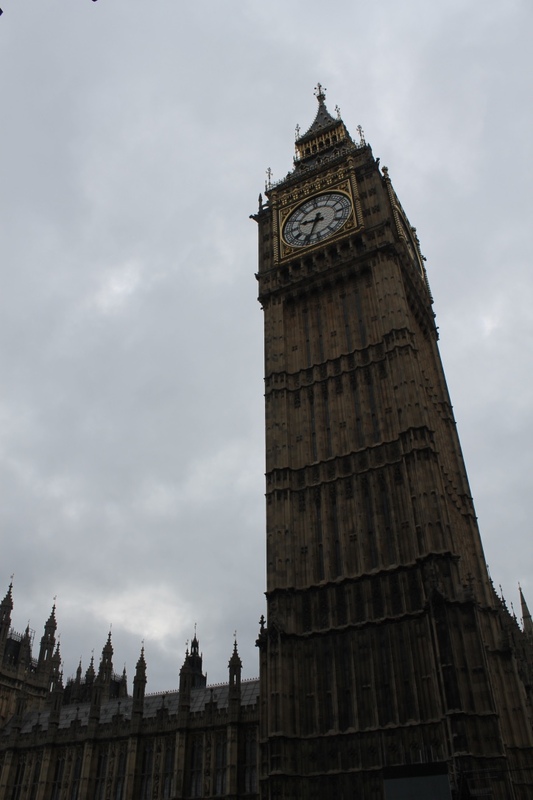 When Big Ben struck 11am (a wave of electricity still runs through me whenever I hear Big Ben chime – it’s one of my favourite sounds), cannons fired and silence answered. 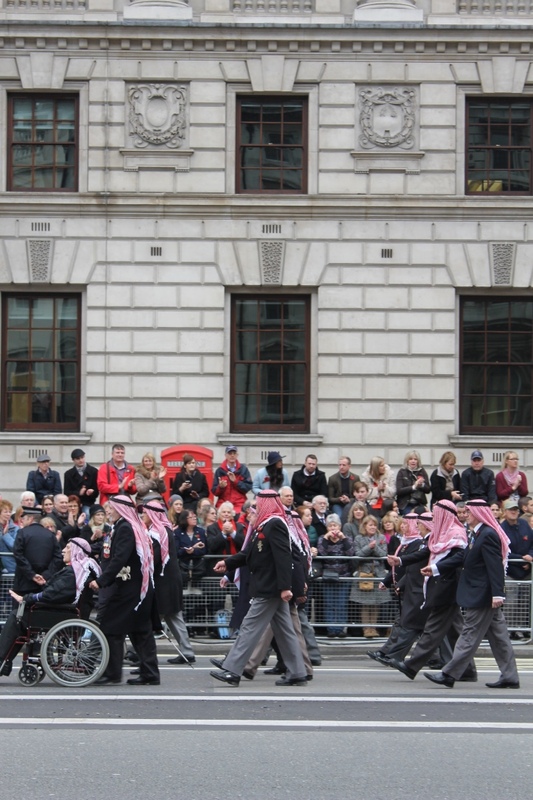 I wasn’t sure what to expect on a London street, the pavements packed with onlookers. But deafening silence reigned. No child spoke or cried. Cameras stopped clicking. All I could hear was the flapping of a plastic poncho, modelled by a lady ahead of me, and a bird singing. It struck me how unusual it was to hear a bird chorusing on a thriving London street. 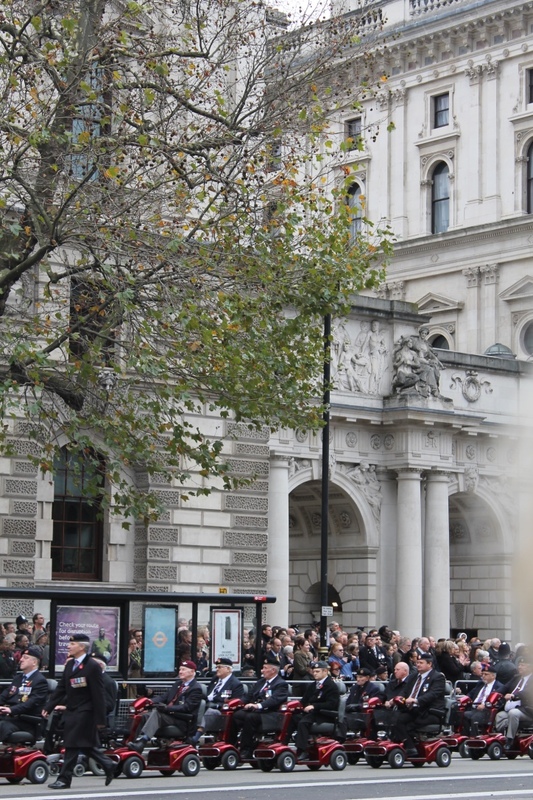 The two minutes concluded with more cannon fire and the Last Post, which always manages to bring a tear to my eye. 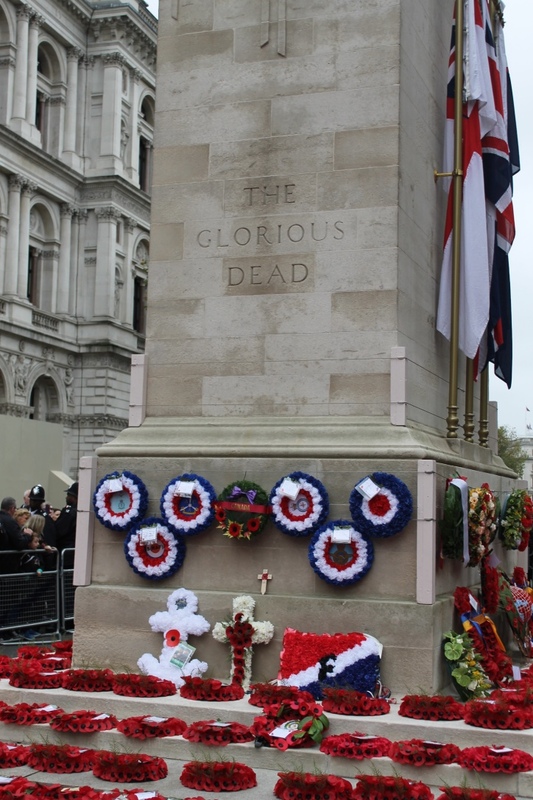 I’m posting this on 11th November, Armistice Day, when the cannons of the First World War stopped firing at 11am in 1918 and the conflict ceased. 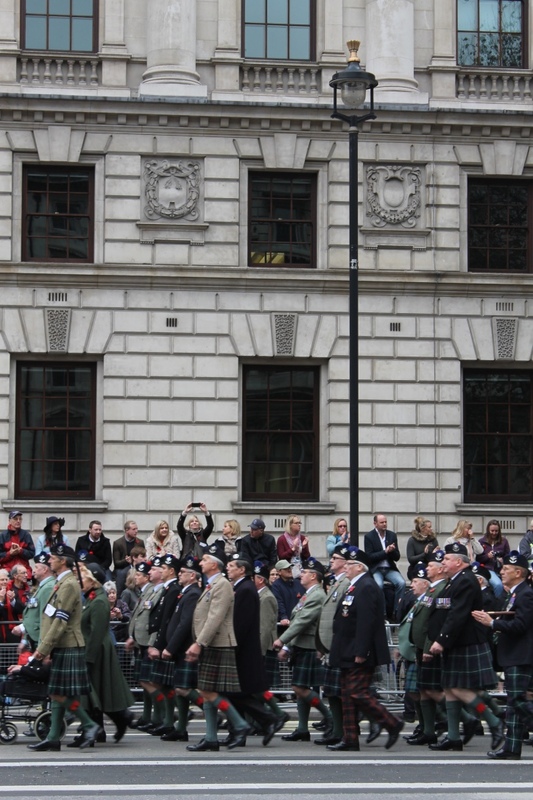 A two-minute silence is traditionally held at 11am on 11th November every year. 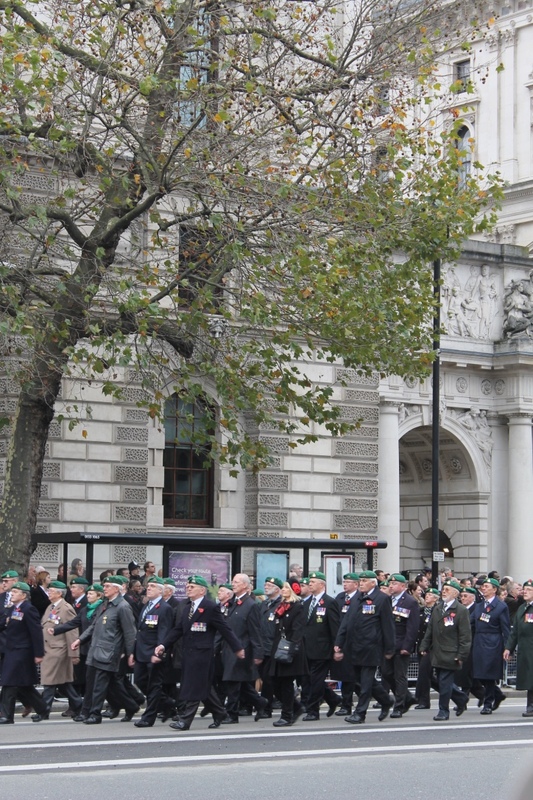 Whether at school, or at work, much of the nation stops for two minutes to think and pay respects to our fallen. Very poignantly, Owen died exactly one week before the signing of the Armistice on the 11th November 1918. And so, this year, when my office stops for those two minutes, I will be thinking about Wilfred Owen and Dulce et Decorum Est. Thank you, Becky, for your brilliant choice of Little Black Classic. 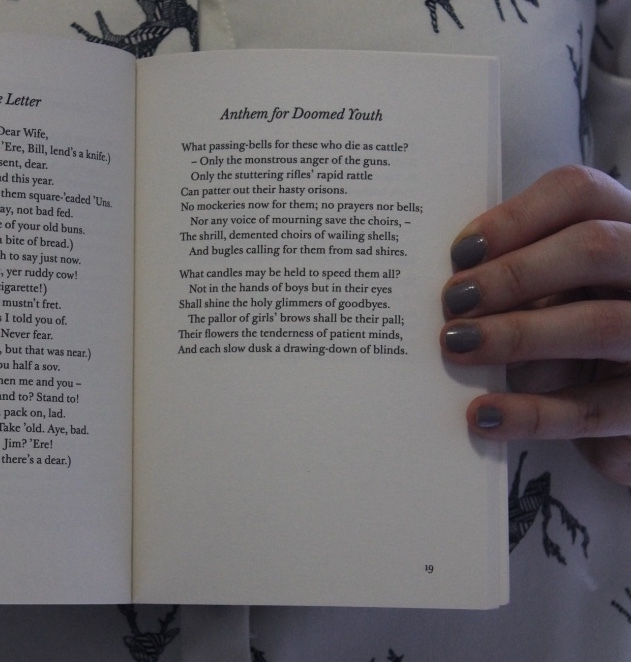 ‘Enjoyed it’ isn’t the phrase, but I did really appreciate these poems. 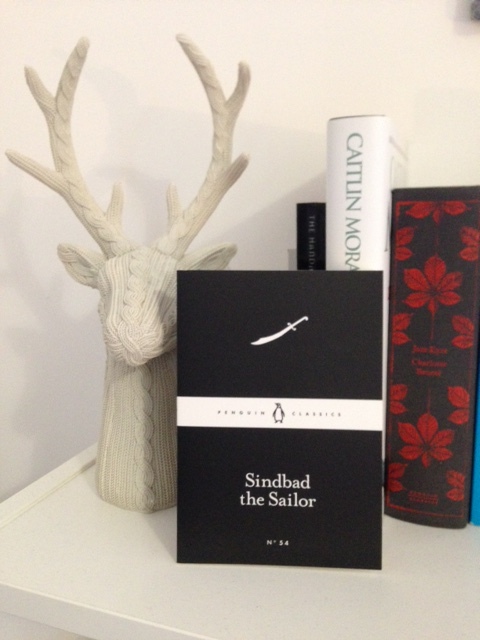 Next time I will be reading Sinbad the Sailor. 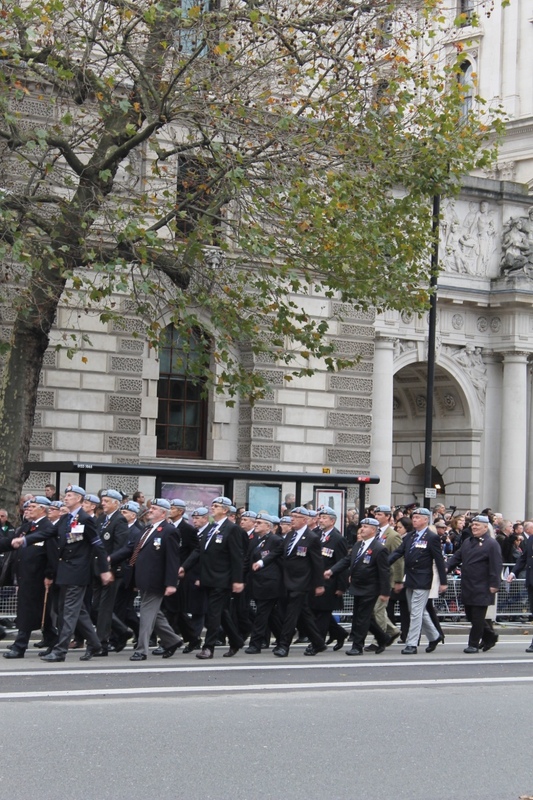 As promised, here are just a few (no, I’m serious) of the veterans who marched along Whitehall. Thank you for posting this today, Lucy – beautiful, and so very apt.